Orange County is a county in the U.S. state of California and its county seat is Santa Ana. As of 2010 U.S. Census, the county had a population of 3,010,579, making it the second most populous county in California, behind Los Angeles County. It is the sixth most populous county in the United States as of 2009 while at the same time is also the smallest county in Southern California. The county is famous for its tourism, as the home of Disneyland and Knott’s Berry Farm, as well as several beaches along its more than forty miles (64 km) of coastline. It is also known for its affluence and political conservatism. 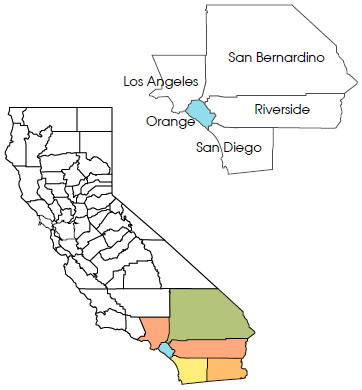 Whereas most population centers in the United States tend to be identified by a major city, there is no defined urban center in Orange County. It is mostly sub-urban, except for some traditionally urban areas at the centers of the older cities of Anaheim, Santa Ana, Orange, Huntington Beach, and Fullerton. There are also several edge city-style developments such as South Coast Metro and Newport Center. While Santa Ana serves as the governmental center of the county, Anaheim is its main tourist destination, and Irvine its major business and financial hub. Orange County is the headquarters of many Fortune 500 companies and Fortune 1000 companies. Irvine is also the home of notable technology companies. Tourism remains a vital aspect of Orange County’s economy. Anaheim is the main tourist hub, with the Disneyland Resort’s Disneyland being the second most visited theme park in the world. Also Knott’s Berry Farm, which gets about seven million visitors annually, is located in the city of Buena Park. The Anaheim Convention Center receives many major conventions throughout the year. Resorts within the Beach Cities receive visitors throughout the year due to their close proximity to the beach, biking paths, mountain hiking trails, golf courses, and shopping.